Ilhabela (Portuguese for Beautiful Island) is an archipelago and city situated in the Atlantic Ocean four miles (6 kilometres) off the coast of São Paulo state in Brazil. The city is 205 km (127 mi) from the city of São Pauloand 340 km (210 mi) from the city of Rio de Janeiro. 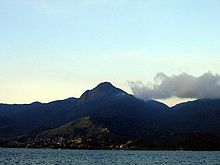 The largest island, although commonly called Ilhabela, is officially named Ilha de São Sebastião (St. Sebastian Island). It, the other islands (Búzios, Pescadores and Vitória) and the islets (Cabras, Castelhanos, Enchovas, Figueira, Lagoa and Serraria) make up the municipality of Ilhabela. 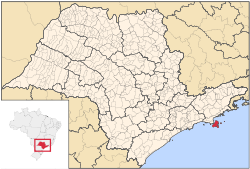 Ilhabela is part of the Metropolitan Region of Vale do Paraíba e Litoral Norte. The population is 32,197 (2015 est.). 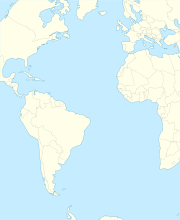 The islands in total cover 347.52 km2 (134.18 sq mi). During the holiday months, up to one hundred thousand people may be on the island, since it is a popular destination for tourists. To access the city, one must take a boat or ferry in São Sebastião, as there are no roads which reach it. During the summer, one may wait several hours to take the ferry boat. The ferry takes 15 minutes to cross the channel between the two cities. Before Portugal colonized Brazil in 1500, an indigenous tribe called the Tupinambas, inhabited the island. They called the island 'Ciribai', which means tranquil place. The island was named São Sebastião Island by Amerigo Vespucci, on January 20, 1502. During the 16th century, the Portuguese set up military points on the shore of São Sebastião Island. In August 1591, notorious British explorer Thomas Cavendish spent some time in the island. He was on an expedition to the south of the Strait of Magellan accompanied by navigator John Davis and then returned to Brazil, where they hid and refueled in Ilhabela and looted Santos and São Vicente. On September 3, 1805, the Governor of the Province of São Paulo, Antônio José da França e Horta, decreted the political-administrative independence of the county. The Island had already 3.000 inhabitants at that time. The new county was named Villa Bella da Princeza, paying homage to the princess of Beira. On November 30, 1938, during the Getúlio Vargas' Estado Novo, an act altered the name of the county to Formosa. Six years later, on November 30, 1944, another act ultimately changed the name to Ilhabela. Since the second half of the 20th century, the city is a popular touristic destination. Among the current critical issues of the island, is the lack of proper sewage pipes to collect all houses' wastewater. As of January 2012, 46,6% of the buildings in the island lacked such infrastructure. In February 2016, the city hall announced R$12 million to be invested in sewer systems for the southern part of the city. By the time it was announced, Ilhabela was the worst coastal municipality in the state of São Paulo in terms of sanitary treatment, according to a research by the State Secretary of the Environment - 35% of the city's sewer is collected, pre-conditioned and released on the sea, according to the secretary, while the city hall claims 61% of the city is covered by sewer systems. Vitória (left) and Búzios (right) islands seen from the South. The municipality comprises the main island, Ilha de São Sebastião, and three smaller inhabited islands: Buzios and Vitória islands, 7½ and 2½ km away from the northeastern tip of the main island, respectively, and Pescadores Island, near Vitória Island. Buzios and Vitória are home to 142 and 50 caiçaras, respectively. There are also the very small islets (das Cabras, da Sumítica, da Serraria, dos Castelhanos, da Lagoa, da Figueira e das Enchovas islands). Almost all the urbanized areas are in the very narrow plains between the sea and the mountains of the main island, preferably at the west part of the island, facing the continent. Most of the city has a humid subtropical climate, but the mountains have an oceanic climate, because of the high altitude. The Atlantic Forest covers the entire city. Ilhabela is a popular sailing point. Several regattas take place at the city's coast. Also, it is popular for many other watersports, including scuba and free diving. The waters around the archipelago are filled with more than 50 shipwrecks, six of them being opened for visiting via diving. Cetacean diversity is rich in the areas, and whale watchings targeting such as humpback whales, bryde's whales, minke whales, southern right whales, orcas, and dolphins are also available. There are many hiking trails with varying degrees of difficulty and 360 waterfalls in the Atlantic jungle. The only way to access the island by car is via the ferry boats that cross the channel. Each boat carries up to 70 vehicles and takes 15 minutes to sail through the 2.4 kilometers that separate the two stations. The SP-131 is the main road on the main island, running from the southwestern coast of the island to its northern coast (both these edges are paved since 2008). The road has three different names throughout its path. ^ Jump up to: a b Bueno, Chris (1 June 2010). "Ilhabela: Conheça as belezas da maior ilha marítima brasileira!" (in Portuguese). 360 Graus. Retrieved 8 January 2012. Jump up ^ Dória, Palmério (2013). ""Só um bobo dá a telefonia para estrangeiros"". O Príncipe da Privataria (in Portuguese) (1 ed.). São Paulo: Geração Editorial. p. 274. ISBN 978-85-8130-201-0. Jump up ^ Geraque, Eduardo; Talita Bedinelli; Daniel Marenco (29 January 2012). "Esgoto de 31 mil casas do litoral vão parar no mar". Folha de S.Paulo (in Portuguese). São Paulo, Ilhabela. p. C5. Jump up ^ "Rede de esgoto chega ao sul de Ilhabela com investimento de R$ 12 milhões". Nova Imprensa. 18 February 2016. Retrieved 25 February 2016. Jump up ^ da Silva, José Benedito (8 January 2012). "Falta de tudo, menos quem tenha Oliveira no sobrenome" (in Portuguese). Folha de S.Paulo. ^ Jump up to: a b c Nogueira, Kiko (2007). Guia Quatro Rodas Praias 2007 (in Portuguese). São Paulo: Editora Abril. p. 92. ^ Jump up to: a b c Santos, Raquel. "Capital da vela é destino certo para todos os gostos e idades" (in Portuguese). Guia do Litoral. Retrieved 8 January 2012. ^ Jump up to: a b "Ilhabela at Brasil Turismo". Retrieved 8 January 2012. Jump up ^ "Baleias encontradas em Ilha Bela Litoral São Paulo". YouTube. 2015-09-01. Retrieved 2016-02-06. Jump up ^ "Baleias e golfinhos em Ilhabela". YouTube. 2013-12-13. Retrieved 2016-02-06. Jump up ^ "Baleias no nascer do sol Ilhabela 31 12 12". YouTube. 2013-01-09. Retrieved 2016-02-06. Jump up ^ "Ponta De Sepituba - Ilhabela - Pescaria Com Visita De Uma Baleia". YouTube. 2009-12-30. Retrieved 2016-02-06. Jump up ^ "Baleia Minke". YouTube. 2013-12-22. Retrieved 2016-02-06. Jump up ^ "Regata Ilhabela Santos 2010 foi acompanhada por Baleias e Golfinhos.". YouTube. 2010-09-02. Retrieved 2016-02-06. Jump up ^ "Baleias em Ilha Bela". YouTube. Retrieved 2016-02-06. Jump up ^ "Baleia durante a travessia da balsa - Ilhabela". YouTube. Retrieved 2016-02-06. Jump up ^ "Canal de Ilhabela com baleia e filhote". YouTube. 2013-12-13. Retrieved 2016-02-06. Jump up ^ "Baleias Orcas em Ilhabela". YouTube. Retrieved 2016-02-06. Jump up ^ "Orca em Ilhabela". YouTube. Retrieved 2016-02-06. Jump up ^ "Baleias em Ilhabela". YouTube. 2015-03-17. Retrieved 2016-02-06. Jump up ^ "Baleia Orca". YouTube. 2013-12-13. Retrieved 2016-02-06. Jump up ^ "Orcas em Ilhabela 2". YouTube. Retrieved 2016-02-06. Jump up ^ McOwan, Gavin (15 April 2009). "Top 10 beaches in Brazil". The Guardian. Retrieved 3 August 2012. Wikimedia Commons has media related to Ilhabela.